WHO WAS MISS SNARK’S FIRST VICTIM? AUTHORESS, OF COURSE! Well known with us writerly types, Authoress is the mysterious webmistress, writer, blogger, tweeter extraordinaire who hundreds of aspiring authors rush to email every month with their first 250 words for her Secret Agent contest on http://misssnarksfirstvictim.blogspot.com! If you’ve been in a witness protection program without internet access, or locked in a dungeon, you might have no clue what I’m talking about! Never fear – Authoress is here to fill you in! Q: The first and most obvious question I have for you Ms. Authoress, is why the blog name Miss Snark’s First Victim? Q: Right into the second obvious question, why the anonymity as Authoress? A: As an author who’s had an online presence for years, I made the decision early on to keep my querying/rejection process private. I find it a bit…unprofessional…to flash those statistics around while journeying toward publication. So when I birthed the blog, I decided to stay anonymous. Q: What is the Secret Agent contest? How did you approach the first Secret Agent about doing a contest? How long after you began Miss Snark’s First Victim did you host the first SA? A: The Secret Agent contest is a 250-word, first page critique contest during which an unnamed literary agent — our “Secret Agent” — leaves comments along with the other critters and then chooses a winner(s). I approached the first Secret Agent — and subsequent agents — by writing a polite, anonymous business letter, which included a link to my blog. The first SA contest was held in July, 2008 (featuring agent Holly Root), three months after I started the blog. Q: Just how important is the first, measly 250 words anyway? A: In the grand scheme of things? It’s not any more important than the rest of your novel. In the nab-an-agent arena, though, those “measly” 250 words have the power to hook or to bore the reader. So they need to be well written, tight, hinting at conflict. Q: 2009 marked the first SA contest leading to a writer gaining representation! Can you tell us a little bit about that? You must feel like a proud mama, huh? A: Well, if the blog readers are my “baby,” then I suppose I do! 2009 actually saw two writers gain representation through SA contests: The first was our March winner, who signed with Secret Agent Josh Getzler (story here: http://misssnarksfirstvictim.blogspot.com/2009/08/secret-agent-lands-client-from-contest.html); the second was our September winner, who signed with Secret Agent Ginger Clark (story here: http://misssnarksfirstvictim.blogspot.com/2009/10/secret-agent-success-or-story-of-steph.html). I view these client signings as landmark moments for the blog. Our “premium slush pile” is living up to its name! Q: You have an e-book available titled Agent: Demystified, Lifting the veil on the secret world of literary agents. Can you tell us about your e-book and what lead you to write it? A: Two things led to my writing the e-book: my own (angst-ridden) journey and my desire to impart the truth that Agents Are Not Scary to all aspiring authors. Most of my readers don’t know the story of my Agent From Hell, and how that experience ultimately led to where I am today–informed, savvy, and definitely not afraid of agents! Agent: Demystified is a simple-to-follow “unveiling” that teaches writers to approach agents confidently and appropriately. You’ll find the trailer and purchase information here: http://www.authoresspress.com. Q: Through Miss Snark’s First Victim, you’ve made numerous, valuable contacts. What advice do you have for writers who are looking to network with agents through blogs, Twitter, or conferences? More importantly, should they be afraid? Do agents really bite like we hear they do? Are there unspoken rules that will get your email address blacklisted for auto-rejections when you query? Like pitching in the ladies room???? A: Well, as I said above, I want authors to stop fearing those (fanged, blood-sucking) agents! The bottom line is that seeking an agent is like any other business contact, and should be approached as such. Anyone in the business world knows that there’s a lot of dysfunction out there, and the same goes for those seeking publication. Authors need to be informed, mature, and business-savvy. All this on top of writing well, naturally. And pitching in the ladies’ room is something I am CERTAIN none of my blog readers would even consider! Q: Queries. In your opinion, more important, less important, or equally important as those first 250 words? A: Is this a trick question? =) The query is equally important, because agents will see it first. Of course, many agents will tell you that a so-so query will be trumped by an excellent writing example tagged onto the end. Which is why I always (and everyone should always) follow the advice of the esteemed Miss Snark and include the first five pages of the novel. Q: Anyone who follows your blog or Twitter knows that you have your own first novel ready to query! Congrats! Can you tell us a wee bit about it? A: Thank you! It’s actually my fourth novel, and the first one doesn’t count (because, yanno, who actually admits she wrote that first, rambling, embarrassing piece of purple prose?). My current project is a YA dystopian about which I’m very excited! It’s already generated some interest, so we’ll see what happens. Fun tidbit? The main character is named after my husband (how sappy is that?). Q: Favorite memory or moment from the blogosphere of Miss Snark’s First Victim? A: I’ve got to say that my favorite moments occur when my readers flood me with outpourings of support, affirmation, and affection. I don’t know why I’m so blown away every time it happens, but it really does take my breath away. It’s amazing how much you get back when you’re not setting out to get something in the first place. My blog wouldn’t be what it is today without my awesome readers. A great big THANK YOU from all of us who have ever benefited from the Secret Agent contest, and a great big GOOD LUCK to you for your querying endeavors! We’ll keep on reading along! And THANK YOU for this wonderful interview! It has been my pleasure and my honor. Readers – leave Authoress a big thanks in our comments! Original interview published on Old People Writing for Teens by GotYA contributor Jamie Blair. To view the original post and reader comments, please click here. Querying. I swear it’s like being back in high school. Prom is a month away and I still don’t have a date. When I finally screw up my courage and ask the guy who sits next to me in art class, he says he’s asked a girl who’s thinking about it—if she says no, maybe he’ll keep me in mind. Forget getting on the field. I can’t even get on the bench with the rest of the backups. Okay –it’s not that bad. I’ve had interest and nudges, winks and flirtatious smiles, but I’m still waiting for that elusive email or call. The one that says: I want to go with you. And, while I wait for that, I’ve increasingly been having flashbacks to the hell that was dating in high school. Fortunately, there are ways to deal with the angst and I’ve jotted them down in a handy list format. Support from my betas. I had wonderful comments from them and re-reading those cheers me up immensely. The fact that one of them has thought of rereading my little manuscript makes me all happy and teary. Friends and family. They love me so I know they’ll put up with an occasional Bridget Jones’ angst. Heck, if it’s a choice between dating angst and agent angst, they’ll probably pick the agent. Absolute Write. Because EVERYONE who has tried to get an agent has gone through this. The gym. Endorphins. Enough said. Pretty in Pink, Some Kind of Wonderful, and Romy and Michelle’s High School Reunion. All movies where the underdog comes out on top. Falling in love with a new project. So what about you? What picks you up when you’re in the query doldrums? When you perform a song, you’re judged on stage presence. You can miss a note, forget a few words—whatever—and still shine if you own the stage. Online presence for writers is just as important. The Internet is an excellent tool for meeting other writers and *gasp* connecting with agents. Just remember, no matter how much privacy protection you place on your accounts, there’s always a way for your words to get out to the public. Be cautious and courteous without sacrificing you creativity. I’ll admit it, I’m lame. Up until last March the only web presence I had was my wilting Myspace account that I made in 2005. You know, the account I only signed into like once a week? Then I joined Absolute Write and found out about Twitter. 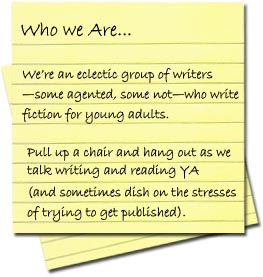 I immediately joined, and I can honestly say that I think it’s one of the best ways to chat with other writers—aspiring and published—in addition to agents. Keep an eye out for #askagent, an occasional Twitter chat held by agents who answer your non-query related questions. If you’re available at 9pm EST on Tuesday and Wednesday nights, stop by #kidlitchat and #yalitchat to mingle with writers, editors, and agents. Have something to say? Put it in a blog. You can basically blog about anything you want to talk about, but it’s usually a good idea to mention writing at some point. Don’t expect your blog to earn an immediate following. Use your blogging experience to make new friends. Visit other writers’ blogs frequently and leave comments. In addition, check out what agents have to say by visiting theirs. Don’t be afraid to comment an agent’s post—he or she wants to hear your opinion! I would have eventually figured out how the publishing process works on my own; however, I learned super fast after finding Absolute Write and the BlueBoards. Drop your lurker status and create an account—after all, there’s no reason to be shy because nobody can actually see you. Get to know your writer peers. They’re incredible people who really understand what you’re trying to accomplish and the highs and lows you’ll encounter getting there. Some men of literature we love, we hate, or find our self torn about. But no matter what, they bring out strong emotions in the female reader. Which brings me to my main question: What makes you swoon? Is it the way he looks, or how he treats the female love intrest? Like all women I find different traits attractive in a man, but I think we all like the unattainable guy that only shows his softer side to the girl he loves. In the upcoming year or two, so many of our favorite boys will be coming to the big screen for movie adaptations, which excites me and frightens me at the same time because sometimes Hollywood nails it and sometimes they don’t. When I read a novel I picture the character vividly in my mind based on the writers description, and I hate when my dream gets shot down by a fugly boy. So let me ask you this, as a writer, how do you develop your male character? Do you simply create a man that you’d fall head over heels for, or do you ask around, find out what’s hot? There are so many hotties in the literary world. Who’s your favorite? Ah…. I love Finding Nemo. Many thanks to Disney/Pixar for creating it. And it leads nicely into my post for today – character flaws. Ask Daphne had some interesting thoughts on perfect characters, namely, that it’s hard to like them. Anell, a friend of mine, has named this writing style “first person perfect” hahaha. None of us are perfect, so why would we relate to perfect characters? In Catalyst, my WIP, character flaws were my favorite part to develop. The thought that I went with was that people can cause all kinds of trouble without being evil. They can be thoughtless, or neurotic, or selfish, or immature, or view the world in stereotypes. Kate, my MC, is all of these, at times, and that’s where most of her trouble comes in. For example, she’s got preconceived opinions about hippies and 4H’ers, as well as about society’s preoccupation with size – something she struggles against and falls into at the same time. But characters that are only weak, or only selfish, don’t have appeal for me. It’s a balancing act. Kate loves her family, her pet, and her friends. She does random good deeds and bites back retorts in situations that would have me spewing them (I’m not perfect either, folks…). Heros can still be good – but that Achilles heel is what makes them relatable. Tell me about your characters, what’re they like? Have you ever noticed that epiphanies for WIPs come at the strangest times? Last week I took a trip to Disneyland with my boyfriend. He had never been, so it was as exciting for me as it was for him. I spent the two days dragging him along the park with one hand, ice cream in the other. One of my favorite rides is Splash Mountain. I don’t know if it has something to do with the fact that I love water rides or that most of it runs through a faux cave (I have this thing for caves). It was one of the attractions we hit first thing, and in the middle of the ride, you know, the part where the animals’ Laughing Place song echoes off the cavern walls and the lights are all colored blue and green and purple, an idea hit me. Bam. In my face. I could have stood up on that drifting log and screamed ‘Hallelujah’. I’ve been working on separate subplots for the five-book series I hope my WIP LUMINOUS will eventually turn into. During this little trip down Critter Country’s most beloved mountain, Mr. Plot Point came and slapped me in the face. And again on Indiana Jones. And again on Pirates of the Caribbean. I freaking love amusement parks. I guess I receive epiphanies at really bizarre times instead of when I’m actually at my computer–You know, at Disneyland, in the dentist office waiting room, while reading a Hermione Granger/Lucius Malfoy fanfic (Don’t Judge). Without them, my WIP wouldn’t be the same. So comment and tell me a story of a moment when you received an idea for your WIP while doing something either mundaine or out of the ordinary. Did you think, ‘Wow, how the heck did I come up with that?’, or did you know the reason behind your sudden spark? Original post published on Old People Writing for Teens by GotYA contributor Sarah Harian. To view original post and reader comments, please click here. First off, I really loved Handcuffs and think you did an awesome job. By far the most asked question is one I know the answer to but will ask anyway so the readers will have the answer too. Have you ever had an experience with handcuffs? And if yes, care to elaborate? Actually the only experience I had was trying out the logistics of the scene, with the office chair and all, figuring out where he was sitting and what was going on… Now since the book came out I keep getting gifts of handcuffs, I even have a pair (from a librarian) in my car’s glove box. But no, I didn’t have any extensive handcuffs experience. Another question that seems to be burning on everyone’s mind: Was there a reason the boy had no name? Was there a deep literary meaning? I guess from that standpoint I liked the fact that you could tell it was him without a name being used. Parker is so aware of him. I kind of wanted to see how long I could keep it up, and I was able to do it for the entire manuscript. It was one of the things I really hoped no one would want to change, and luckily, no one suggested it be changed! Why choose handcuffs instead of duct tape or rope? I never thought of duct tape or rope. In the scene he pulls the Handcuffs out of his pocket and asks Parker if she wants to have some fun. I don’t think duct tape would have the same effect. Moving on to your writing career. Do you have anything in the works? And at what stage are those works? I wrote a realistic contemporary after Handcuffs called Greedy. The main character is bisexual, though that’s just part of the plot. Delacorte didn’t feel it was the right follow up for Handcuffs, and my agent has subbed it to a few houses. I just sent a new manuscript to my agent. It’s pretty different, not realistic contemp, in fact, as it’s a retelling of a famous story, a Poe story, in fact. I’m referring to it as A Tale told by an English Teacher . Until I talk to my agent about it, I guess I’m not revealing any major details, though I did excerpt it on teaser tuesday once. I know you are a teacher, and from what I understand a really cool one. Why did you choose to write YA? The coolness is probably up for debate. I tried MG once and never finished anything, I think I need a bit of edginess and sexual tension to make me finish the story. I don’t have any strong motivation to write for adults, though I guess I’d try it if I had time and ideas. Were there sacrifices you had to make or you family had to make while you were writing? If so, at what stage were the sacrifices the hardest? I gave up on a certain amount of interaction with my kids, and having a social life, and watching television. I’d say the stuff with the kids was the hardest, but I’m not sure parents should be with their young kids every minute, so paying someone to watch them three days a week during the summer didn’t permanently damage any of us, and neither did sending them to Grammas every other weekend. I got through this really fast with Handcuffs. Revisions were a bit hard, but it was a fast process, and exciting. I think that wanting to know how everything got resolved is what got me through it. This one was exciting too. I like to relate that I got seven requests before I got any rejections. I ended up with about a 50/50 rejection/request rate, but being at 100% was pretty exciting. So, I guess the excitement got me through this part. At four weeks I thought it wasn’t going to sell and I started revising it for a second round of subs. Then, at 5 weeks, it sold! I just tried to keep my mind off of it, I guess. I was insanely nervous, and afraid it wouldn’t sell. That was a long process. I just kept working on other stuff. And living life, and only thinking and talking about it occasionally. If you could spend time with one author living or dead who would it be and why? I always say Stephen King cause I’ve read enough of his stuff to really have a conversation and you know he’d be interesting. Balderdash, or Taboo, or on the computer it would be Sid Meijer’s Civilization!!!! Handcuffs is well worth the read so if you haven’t read it, go get it Thanks Bethany for the awesome interview! Original interview published on Old People Writing for Teens by GotYA contributor Jennifer Wood. To view the original post and reader comments, please click here. I love hot, smexy smooching scenes. My favorite part of any book or movie is when The Kiss happens. It’s also my favorite scene to write. After building the relationship between my MC and her/his Love Interest to the point of their lips crushing together in an urgent moment of molten hot passion…okay, so it’s not always like that. Sometimes writing needs inspiration. Here are a few kisses that I call my favorites! 2009’s accomplishment: 1 great concept, and 1 great execution, just not in the same MS…. 2010 goal: Get an MS where the execution and the concept are both fabulous. In February of 2009, I had a dream and put that dream on paper the next day. My adult writing life was born. I finished Meadow in August and started querying in September while I worked on a sequel. After eight queries I realized my beginning sucked and put it on hold. I started a new edgy contemporary, Judgement near the end of September. As November got nearer, I decided to do NaNoWriMo and put Judgement on hold for Larch, a dystopian. I put over 100,000 words on paper and filled a notebook with character profiles, timelines and ideas. At the end of 2009, I am listening to my characters for all three works and plan on finishing them so they’ll be quiet and the next characters can start talking – they’re there, just not saying anything. One of the best things I did for my writing was join Absolute Write because I have absorbed a wealth of information about writing, found awesome reading material and made friends. Plus it led me to this blog. 2009 was very productive for me. I completed and queried three manuscripts, received some helpful feedback from agents on how to revise them, and am as close as I’ve ever been to having an agent to call my own with my first contemporary YA, Lost To Me. Going in to the new year, I’ve hit my goal of being 20k into my work in progress, Fake My Life, and I’m absolutely in love with it. 2010 will be the year I celebrate with my writer friends when a few of them sell their books, and others find agents for their awesome manuscripts! And who knows, I may have a couple accomplishments of my own to toast to! Happy New Year! Oh, 2009. You were stressful but I hate to see you go. In 2009 I proved to myself that I could talk to agents without being reduced to a blithering idiot. Through agent responses and dear AW friends, I gained some fabulous insight into what I needed to improve and discovered that I could, despite all fears and trepidations, successfully undertake a massive rewrite. In 2009, I finished my first and second novels, and queried to agents. I’ve learned more about writing than I could’ve hoped for–my character voices are stronger, I know the difference between passive and active, narration is tight, and my thoughts are easier to convey into words. In 2010, I’d like to finish at least two more novels, land an agent, and throw a nice book deal in the mix. 1) I finished my first novel ever–WOOT–an 80k YA paranormal romance. Sadly, said novel needs a heckuva lot of revising before hitting a query letter near you, but hey–it’s a start! yes, it’s a good idea to have someone other than your mom and dog read your novel before sending it off. 3) Joined Absolute Write, where I met tons of amazing writers and friends. 4) Attended my first writer’s workshop and joined an awesome critique group–Woot! 1) Continue to learn and grow as a writer, and don’t let fear stop me from pursuing ideas. 2) Revise and polish my current WIP, The Demon Guard, until it’s the best it can be–and hopefully send it off by February 1st. 3) Support all my awesome writing friends by being a cheerleader, sympathetic ear, or whatever they need during the lows (not that writers ever have those, ahem) and–even better–helping them celebrate during the many highs! In 2009–I created six cut out characters with names, gave them features, relationships, hates, changed those relationships and hates, found their favorite clothing brand and theme song and wrote their epic one liners, imagined their sequeled destinies–first pains, cries, kisses, love scenes, dire moments– fell in love with them, bawled my eyes out when I trunked them (along with my manuscript), decided I would rather gouge my eyes out than deny a rewrite, and then fell in love again. In 2010–Make it my personal business to have others fall in love with them too.